In this post I am going to describe the properties, origin and cycle of nitrogen, a major plant nutrient, making up 1-5% of the plant dry matter . In future posts, I am going to write more about other major and minor plant nutrients. 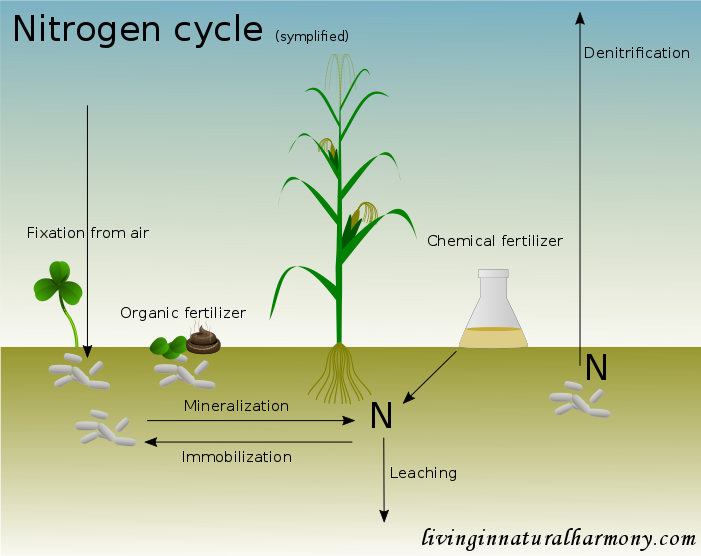 Nitrogen has a strong impact on plant yield and is therefore commonly added in agricultural systems [1,2]. Nitrogen is important for the creation of proteins and DNA, which makes it a vital nutrient for all life . Moreover in plants, nitrogen is also a building block of chlorophyll, the molecule making the plants looking green and more importantly helping to absorb sunlight. Without sufficient supply of nitrogen plant tissues typically appear in lighter tones of green or even yellowish (chlorosis) . The lack of sufficient amounts of nitrogen is further associated with reduced yield and stunted growth . In plants, nitrogen is quite mobile and thus, it is often translocated from older to younger leaves to optimize plant performance . The most important way of nitrogen input into the soil in Nature is the fixation from the air. Air contains 78% nitrogen, representing an abundant source of this nutrient . Specialized microbes are able to fix nitrogen, some of which live freely in the soil and others like to get associated with certain plants . The legume family is well known for the symbiosis with rhizobia bacteria, whereby the plants form nodules in the roots, in which the bacteria live. In this symbiosis, the legumes provide carbohydrates to the bacteria and receive in turn nitrogen compounds. When there is ample nitrogen available in the soil, legumes typically prefer to use this less costly form of nitrogen and thus nitrogen fixation is reduced . The nitrogen fixation encouraged by legumes makes them interesting also from an agricultural point of view. The introduction of legumes in crop rotations (planting different crops sequentially on a field) provides nutrients for subsequent crops, especially when used as green manure (plants are ploughed into the soil and serve as nutrient source) . Once in organic form, the nitrogen can be recycled in the soil. The nitrogen contained in organic matter such as dead plant material is not directly accessible to plants though. In order for plants to profit from it, soil microbes first need to transform it so the nitrogen can be absorbed by plants (mineralization) . This process takes some time, which means that the addition of organic material in agricultural systems may only have a limited immediate, but rather a longer term effect as fertilizer . In fact, the addition of organic matter high in carbon (carbon to nitrogen ratio > 25) may even lead to a decrease in plant available nitrogen in the soil due to immobilisation at first . This happens when the microbial population builds up, using carbon as energy source and absorb nitrogen from the soil to sustain their own life. This nitrogen ultimately gets available again after the microbes die off. The nitrogen in the soil can also be transferred back into the air (denitrification), in which case it is no longer available for plants. In organic agriculture, nitrogen is added in the form of slurry, manure and mulch or other organic materials. Importantly, these inputs do not only add nitrogen but many other nutrients at the same time , unlike chemically produced nitrogen fertilizers. These synthetic fertilizers are produced through the Haber-Bosch process, which consumes a huge amount of energy (1% of global energy!) . The production of one kg of fertilizer requires the energy of about one liter of gasoline! The synthetic forms of nitrogen fertilizer are typically readily plant available, however, at the same time also prone to be lost quickly . These losses include leaching, surface runoff as well as volatilization. They can be problematic directly for humans when drinking water polluted with nitrate  but also create unwanted fertilization effects in natural ecosystems [3,7]. In order to reduce nitrogen losses in organic as well as conventional agricultural systems, the timing and the way of application are important. It has also been shown that covering the storage for manure/slurry can greatly reduce losses due to volatilization (loss of nitrogen as ammonia gas) . When the slurry is added close to or injected into the soil, rather than sprayed (splash plate), volatilization loss can be further reduced . In general, fertilization before strong rains should be avoided, as the rain will increase losses through leaching and runoff. As for other plant nutrients, a sustainable agricultural practice would include the recycling of also the consumed nutrients by humans. However, in many places sewage contains many different forms of wastes (some of them toxic), making it difficult to use it as fertilizer again. In Switzerland for example, since 2006 it is forbidden to use sewage sludge as fertilizer and must be burnt like other waste . There are however new ideas and approaches coming up, which will probably become more widespread in the future. I will dedicate a future post about modern ways of using human waste products as fertilizers. Thanks for reading until the end! I hope you have enjoyed it and learned something new. I would be happy if you could share this article. Marschner, H. (2011). Marschner’s mineral nutrition of higher plants. Academic press. Fustec, J., Lesuffleur, F., Mahieu, S., & Cliquet, J. B. (2010). Nitrogen rhizodeposition of legumes. A review. Agronomy for Sustainable Development, 30(1), 57-66. Diacono, M., & Montemurro, F. (2010). Long-term effects of organic amendments on soil fertility. A review. Agronomy for sustainable development, 30(2), 401-422. Howarth, R. W., & Marino, R. (2006). Nitrogen as the limiting nutrient for eutrophication in coastal marine ecosystems: evolving views over three decades. Limnology and Oceanography, 51(1part2), 364-376. Hörnig, G., Türk, M., & Wanka, U. (1999). Slurry covers to reduce ammonia emission and odour nuisance. Journal of Agricultural Engineering Research, 73(2), 151-157. Wulf, S., Maeting, M., & Clemens, J. (2002). Application technique and slurry co-fermentation effects on ammonia, nitrous oxide, and methane emissions after spreading. Journal of environmental quality, 31(6), 1795-1801.